The big broad theme in the Indian aviation industry this financial year has been pricing pressures. Sure, competitive fares improved load factors but profitability was impacted adversely. InterGlobe Aviation Ltd, the company that runs IndiGo, wasn’t immune to those problems. However, a glimmer of hope is emerging. Yields are showing signs of improvement. The airline had said its January yields declined 10% year-on-year at the time of announcing its December quarter earnings. February and March have been better months on the yield front as the industry tries to deal with rising fuel costs, point out analysts. Kotak Institutional Equities notes that fares for 30 days plus advance bookings have improved only marginally in the past two months, but fares for travel dates earlier than 30 days have increased meaningfully. “This should provide some support to IndiGo’s yield in 4QFY17E, as short-notice trips usually account for a sizeable chunk of the 4QFY17E passengers, as per the management," Mohan Lal, an analyst with Kotak, wrote in a 16 March note. Fuel surcharge to pass on the increase in crude price has been absorbed well by the market, according to IIFL Institutional Equities. The brokerage has raised its financial year 2017 earnings per share estimate by 8% to factor in this improvement. For the nine months to December, IndiGo’s Ebitdar or earnings before interest, taxes, depreciation and aircraft and engine rentals declined 4.4% from a year earlier. Ebitdar margin narrowed 550 basis points to 28.67%. One basis point is one-hundredth of a percentage point. 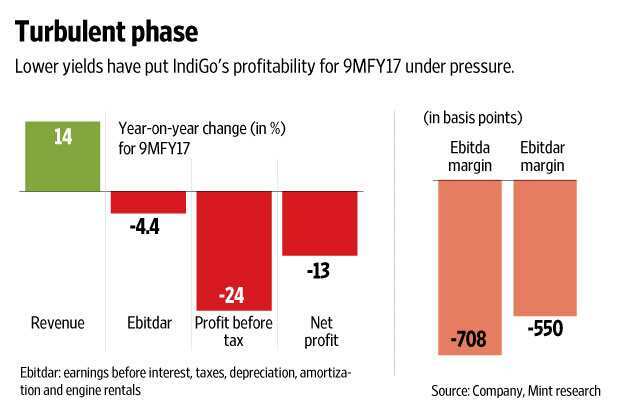 To be sure, even as there are indications of improvement in yields, IndiGo’s profits for the March quarter are expected to decline year-on-year given that crude oil prices were comparatively much lower in the same period last year. Year-on-year yields, too, are expected to fall. In general, analysts hope that financial year 2018 will bring some stabilization in industry yields as the scope for a further decline in yields appears limited. Moreover, a lower base will help. The stock currently trades at Rs921.85, a bit lower than the Rs926.25 share price on 8 November when demonetization was announced. During this time, the benchmark Sensex has increased 7.5%. Based on Kotak’s estimates, one IndiGo share trades at 20 times expected financial year 2017 earnings. It goes without saying that yields and traffic growth are key measures to watch out for. Further, an upside in the stock shall depend on how these factors play out in the coming months and, of course, on the movement in crude oil prices.